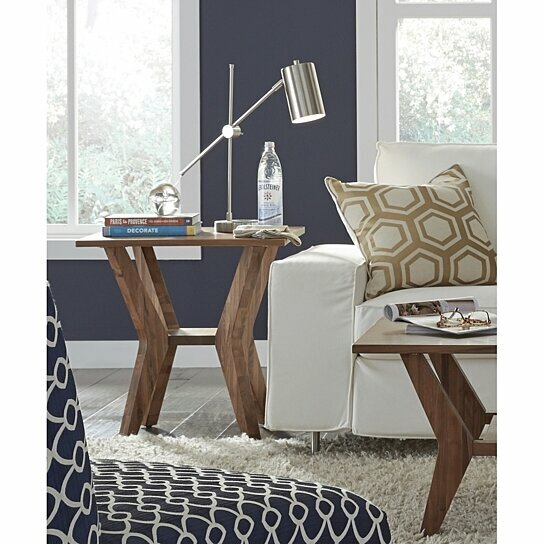 This sleek Side Table will be an elegant and stylish addition to your home. Drawing inspiration from mid-century modern design, this table has dramatic, angled wishbone legs that are fitted with non-marking furniture tacks to protect your floors from scratches. Its shelf is supported by the bends in the table legs to create a seamless design and provide small display space for your decors. Crafted from solid American wood in walnut brown finish with knots, mineral streaks, and other character marks, this table is sure to bring dash in your living room ensemble. Note: Other featured items in image except this Side Table are sold separately. Dramatic, angled wishbone legs support the top of this table. Made from solid walnut wood this table will ensure long term utilization. One small shelf supported by the bends in the table legs create a seamless design and provide small space for display.